Zack Stewart of New Albany, in a tandem parachute harness, hanging high above eastern Tennessee. Those who know Zack Stewart will not be greatly surprised about how he celebrated his 81st birthday. Stewart has lived a long and active life as an engineer, a United States Marine, an elected official, and the “best tree climber in Mississippi.” He likes to build things. Elected five times as North Mississippi’s Transportation Commissioner, he played a key role in building more than 1,200 miles of four-lane highways crisscrossing the state. Zack Stewart and his daughter Temple after he had made a parachute jump and ridden on a hang-glider the day before his 81st birthday. Zack has battled cancer for several years and has undergone countless painful medical procedures. But he never quit. Several months ago he drove alone to a spot in the high desert of New Mexico. The place is so remote, so far from electric lights, that it’s said to be the darkest place in America. He sat there and looked at the stars and planets, as most Americans have never seen them. An inveterate traveler, Stewart has also performed thousands of hours of volunteer work since he retired as Transportation Commissioner in 2004. In March of this year he was named New Albany’s “Volunteer of the Year” at the annual UNITE luncheon. However, there were a couple of things he had never done, still hanging out there on his bucket list. 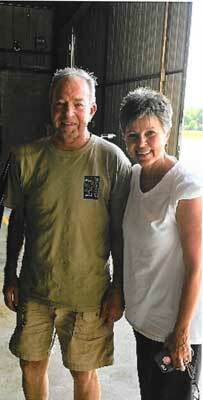 He traveled with his daughter, Temple, to an airfield north of Chattanooga, Tennessee. There, he boarded a single engine airplane, and jumped out of it at an altitude of 3,000 feet. 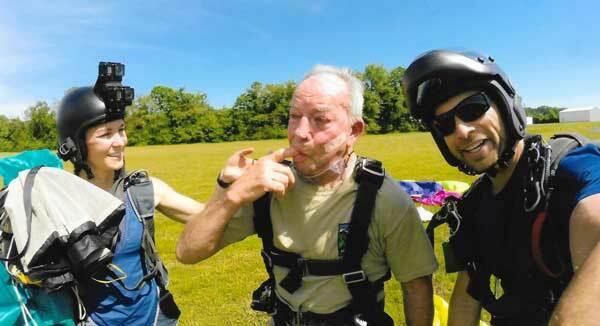 Strapped to an experienced parachutist, he admits to “maybe, being a little scared.” But he did it. That wasn’t enough. Stewart and his daughter then drove south to another airfield in northern Georgia. He boarded a hang glider. A small airplane towed the glider to altitude and cut it loose. He enjoyed several minutes of unpowered flight and landed safely. 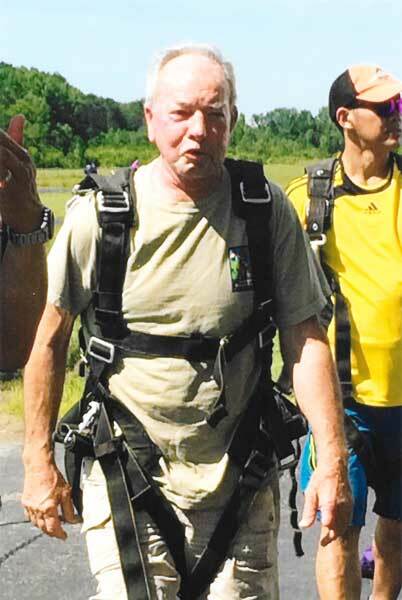 Stewart wet his finger and made an invisible mark in the air, marking “jumping out of an airplane” off his bucket list. Both flights took place on Tuesday, June 26, 2018. The next day was Zack’s 81st birthday. I think this is wonderful. Very happy for him.